UPDATE (10.58 am): UNP MP Sajith Premadasa says that the no-confidence motion against PM Mahinda Rajapaksa was passed in Parliament. “The people have spoken,” he said. UPDATE (10.41 am): The parliament has been adjourned until 10 am tomorrow (15) due to a tense situation. Speaker Karu Jayasuriya has declared that the current government does not have the majority in the Parliament. Former Ranil Wickremesinghe has reportedly left the parliamentary premises. UPDATE (10.35 am): Ministers A. H. M. Fowzie, Piyasena Gamage and MP Manusha Nanayakkara had reportedly crossed over to the Opposition bench at the parliament. UPDATE (10.30 am): A commotion within the parliament is reported as several MPs are protesting the newly elected cabinet stating while the Speaker is attempting to control the situation. UPDATE (10:22 am): The parliamentary session for the day has commenced a short while ago. Meanwhile, Minister Wasantha Senanayake has stated that he will act as an independent MP at the parliament. UPDATE (10.08 am): UNP parliamentarians have, reportedly, arrived at the parliament wearing a piece of black cloth as a mark of objection. UPDATE (9.55 am): JVP has handed over a no confidence motion against PM Mahinda Rajapaksa and the new Cabinet, said JVP MP Vijitha Herath. The parliamentary session for the day is set commence at 10 am today (14), as per Speaker’s notice yesterday (13). 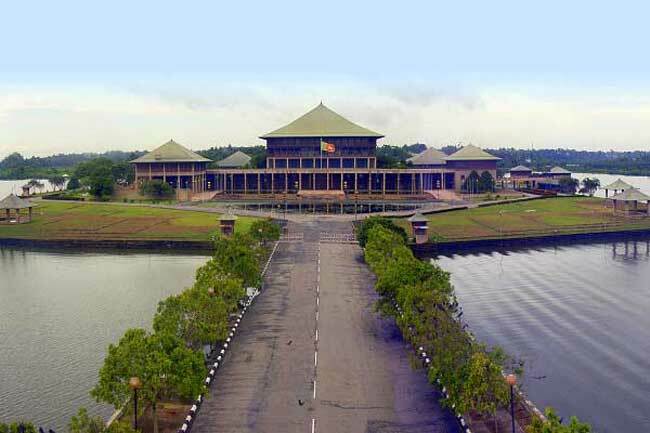 Meanwhile, MPs and Ministers representing their respective political parties along with Prime Minister Mahinda Rajapaksa have arrived at the parliament. Reportedly, the former Prime Minister and UNP leader Ranil Wickremesinghe has also arrived at the parliamentary premises. On Oct. 26, President Sirisena abruptly ousted Prime Minister Ranil Wickremesinghe and replaced him with former President Mahinda Rajapaksa. A day later he prorogued Parliament, allegedly due to lack of support to show majority, and fixed the next session for November 15. He later ordered Parliament to return on Wednesday (Nov. 14), but then dissolved it last Friday and called for new elections in January. The Supreme Court yesterday (13) issued an interim order temporarily suspending the Gazette notification issued by the President on the dissolution of Parliament and calling for fresh polls. The court also issued an interim order on the Elections Commission preventing the holding of a general election. The interim orders were issued effective until December 7.